That’s how spa in Leogang works: Work up a proper sweat in the sauna before falling into deep relaxation during a pleasant massage. Float in the infinity pool afterward whiles your gaze falls onto the mountain peaks. 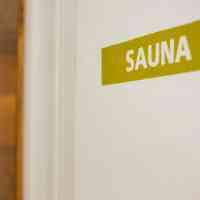 An extensive sweat session relaxes body, mind and soul equally! 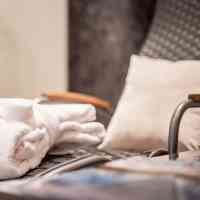 You have the choice between the seriously hot Finnish sauna, the pleasantly warm sanarium, the infrared-cabin with muscle-loosening deep warmth and the solarium in the spa area of your hotel in Leogang. Cool your respiratory system and body in the fresh-air court after your sauna session before taking a pleasant break on one of the comfortable loungers in the spacious rest room wrapped in your bathrobe. 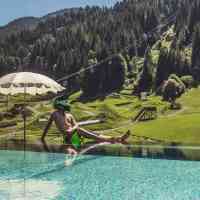 The open year-round infinity panorama pool at the Hotel Bacher in Leogang is “on the top” in the truest sense of the word. The pool, filled with heated water, is situated on the hotel roof. Here you can swim a few laps or simply float in the water while enjoying a phenomenally beautiful view of the surrounding mountains. The line between water and sky simply blurs: Look forward to almost unlimited swimming fun in fresh mountain air. Treat yourself to a few hours just for you during your spa holiday in Leogang. Leave stress behind you and recharge your energy with massages. Gentle touches and the purposeful treatment of tensions and acupressure points will rebalance body and mind. Book your massages with the room reservation to receive your dates of choice. Call +43 (0) 6583 8556 for information and dates. Below are a selection of massages and treatments you can enjoy at the spa hotel Bacher in Leogang. We will gladly inform you about further treatments at reception.